The team at Billingham Grange celebrate their ‘OUTSTANDING’ award with Pete Calverley, CEO of Barchester Healthcare and Stella Bolger, Hospital Director. 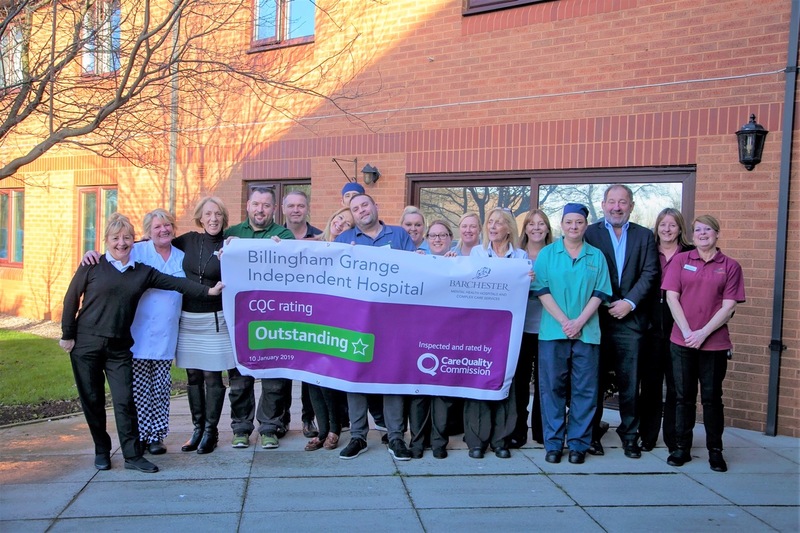 Staff and patients at The Billingham Grange Independent Hospital in Billingham, Durham, are celebrating their recent Care Quality Commission inspection rating, where they scored an overall ‘Outstanding’ after being reviewed for a safe, effective, caring, responsive and well-led service. Currently, only 3.2% of England’s care hospitals, domiciliary care agencies and hospitals have an overall ‘Outstanding’ rating, and Billingham Grange has been ranked among the best in the country for the quality of the services it provides. The CQC inspected the hospital on 23rd and 24th April 2018 (the report was released on 10th January 2019) and rated the hospital, run by Barchester Healthcare, as ‘Outstanding” in two key assessment areas (‘Caring’ & ‘Well-Led’) and ‘Good’ in three (‘Safe’, ‘Effective’ & ‘Responsive’). In celebration of the rating, CEO of Barchester Healthcare Dr Pete Calveley visited the hospital to thank each member of the team personally, and presented each one with a £500 gift voucher in appreciation of their hard work. On the day of the visit, Stella Bolger, the Hospital Director at Billingham Grange said: “We are ecstatic! Our team at Billingham work so hard to provide the highest possible standard of care for our patients and we are so delighted to be recognised for our work by the CQC, and to be rated ‘Outstanding’ overall. The Billingham Grange Independent Hospital is run by Barchester Healthcare, one of the UK’s largest care providers, which is committed to delivering high-quality care across its care homes and hospitals. The Billingham Grange provides long stay or rehabilitation mental health wards for working age adults, wards for older people with enduring mental health problems. The multi-disciplinary team works in collaboration with patients, families and community agencies to develop effective treatment programmes for improving quality of life and maximising independence.